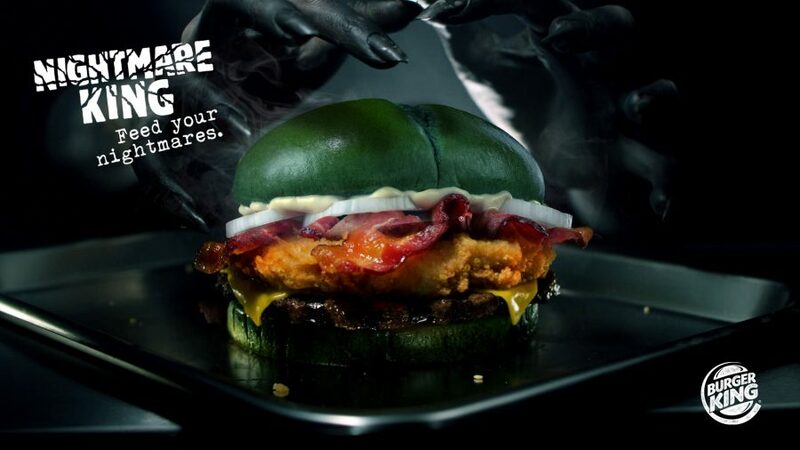 Burger King has released a limited-edition Halloween burger titled, the Nightmare King and claim it is clinically proven to induce nightmares. Packed with meat, the burger features flame-grilled beef, chicken fillet, thick-cut bacon, melted American cheese, mayonnaise and onions, presented in a spooky green glazed sesame bun. Paramount Trials and Florida Sleep and Neuro Diagnostic Services conducted a study of the Nightmare King and Goldforest monitored the sleep of participants who consumed the burger. The study was conducted on 100 participants over ten nights and reviewed their brain activity, heart rate and breath while sleeping. Results of the study showed the combination of proteins from the meat and cheese in the burger caused the subjects’ Rapid Eye Movement (REM) cycled to be interrupted. The REM cycle is a sleep period in which individuals experience most of their dreams. “According to previous studies, four percent of the population experiences nightmares in any given night. But, after eating the Nightmare King, the data obtained from the study indicated that the incidence of nightmares increased by 3.5 times,” said Dr Jose Gabriel Medina, specialised somnologist and lead doctor in Burger King’s study.